The IWCC lifestyle is waiting for buyers looking for a single story in a guard gated community. Home features 4 bedrooms, 2.5 baths, formal living & dining room, family room w/fp, and open kitchen area for indoor/outdoor entertaining. The kitchen was updated with granite countertops, gas range and stylish cabinets, along with a lrg pantry and casual dining. Bdrms are spacious with mirrored wardrobes and MasterBdrm has organized lrg walk-in closet. MasterBath features a soaking tub & separate lrg glass enclosed shower.Wraparound yard highlights the pool & spa, along w/built-in sink, BBQ and refrigerator. Great for entertaining! There are fruit trees, planters & grassy area for those who love to garden. 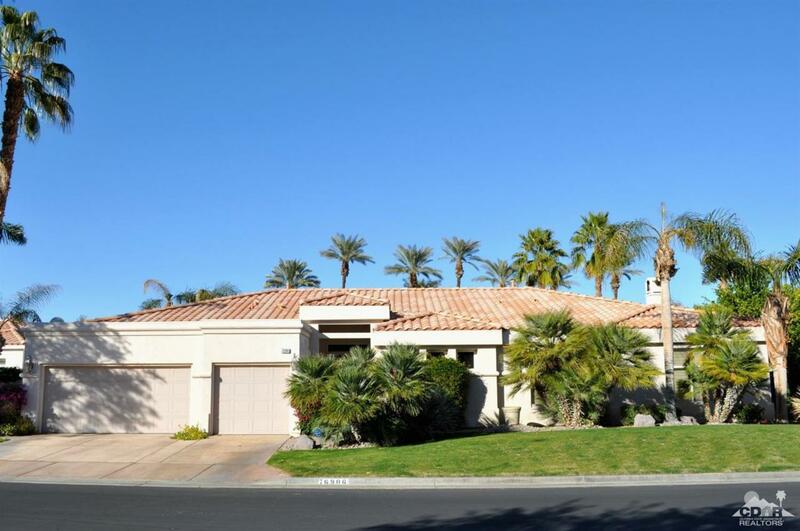 Home has been an investment property for owners and has lots of potential to easily turn it into the ultimate desert retreat in one of the most prestigious gated desert communities. Close to shops, restaurants, entertainment & low HOA dues! Priced to sell quickly in its present condition. Listing provided courtesy of Susan Laxson of Homesmart Professionals.